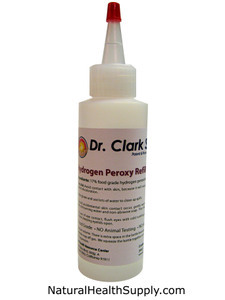 Peroxy 6 fluid oz of 17.5% food grade hydrogen peroxide. Four to five drops in a toothbrush works as a non-abrasive, anti-bacterial and whitening agent for brushing teeth without any metal fillings. Please do not use if you have any metal in your mouth. It may also be used sparingly to disinfect minor wounds. Do not apply directly onto skin. Please dilute with water when using on skin.